I could eat this Stuffed Chicken Breast every single day! It’s super tender, tastes fantastic, and is a healthy meal all by itself. It’s my favorite healthy chicken breast recipe! If you follow this blog, you will know that chicken breast is a central part of my healthy fitness cooking and that I am always searching for delicious, easy and healthy chicken breast recipes. Normally, I would browse Pinterest for recipe ideas, but this one was based entirely on what I had left in the fridge after making a huge salad for lunch. I am sure that there are a thousand very similar recipes out there, but for me, it’s always a pleasure to feel like I am creating something new, not just following someone else’s recipe. Especially when it turns out to be one of the best recipes I have ever cooked! Usually, the word “stuffing” in a recipe makes me run away screaming because it means doing fiddly and complicated stuff for ages. Not what I want when I am tired and just need a quick healthy dinner. Well, this recipe is different! The entire meal can be ready in less than 30 minutes if you don’t mess around. You can chop the vegetables for the stuffing while the oven heats up, and getting the stuffing into the chicken breasts is done in a heartbeat. How can a healthy dinner recipe get much easier than that? This also means that it’s a great dish to make when you have guests. It’s one of my favorite recipes when I want to serve a casual but impressive dinner for my friends and I ALWAYS get asked for the recipe (which just shows that my friends don’t read this website, the lazy oafs…). Guess what? It can get even easier! If you want to cheat a little, you can pre-cook a few chicken breasts, put the stuffing in the cooked chicken, and just microwave everything for about a minute before serving. It won’t be quite as good as when you cook everything together from scratch, but it’s still delicious. I do this a lot when I don’t have time (or am too lazy) to cook. 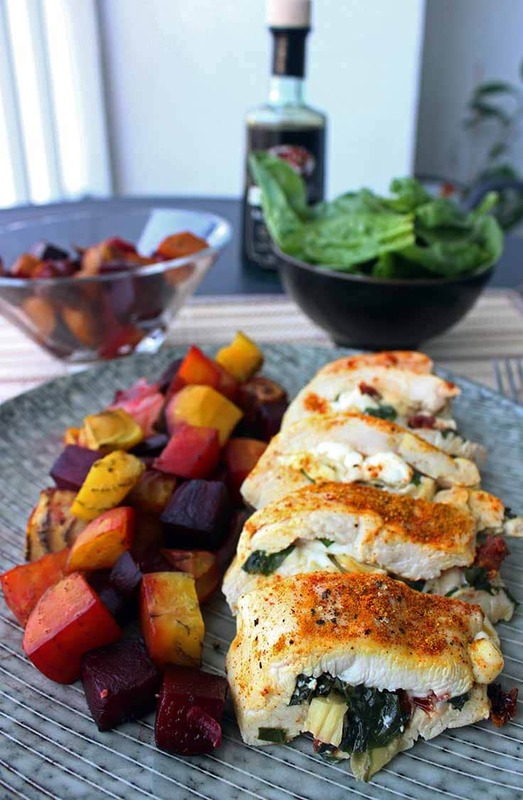 No matter how you make it, this Healthy Stuffed Chicken Breast is a winner! If you liked this Healthy Stuffed Chicken Breast recipe, you should give my Prosciutto Wrapped Chicken Breast with Cream Cheese a try as well. It’s a super simple 4-ingredient recipe and I am sure you will love it. Or if you want something REALLY easy, go for my Mustard Baked Chicken Tenders. That’s a recipe I often make if I am cooking for a lot of people and want a tasty dish I can I can throw together in 5 minutes and just pop in the oven. 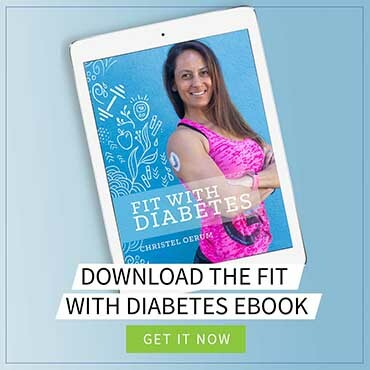 Finally, you can always take a look at my roundup of the best low-carb chicken recipes for people with diabetes. You can never have too many healthy chicken breast recipes, right? 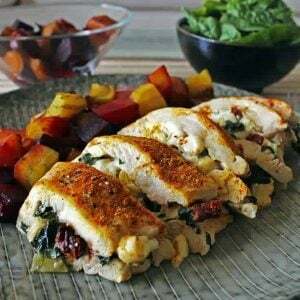 When you’ve tried this healthy stuffed chicken breast recipe, please don’t forget to let me know how you liked it and rate the recipe in the comments below! Preheat the oven to 365 F (185 C). Cut the chicken breast almost halfway through with a sharp knife. Chop up the mozzarella, artichoke, basil, tomato, and garlic. Mix to combine and stuff it into the cut chicken breast. Use a few toothpicks to close the chicken breast around the stuffing (you can see how in the video above). Place the chicken breast on a baking sheet or aluminum foil, and season it with pepper, curry powder, and paprika. Bake for around 20 minutes (depending on the size of the chicken breast). Remember to remove the toothpicks before serving, and you're done! Optional: To make the chicken breast even more tender, start by brining it in salt water as described in my post “How To Cook The Perfect Chicken Breast”. This was delicious! I backed off on the fresh basil a little for the kiddos and was excited to find that this is toddler approved! The chicken breast we used was 6 oz. / 175 g.
Hi I was wondering if the ingredients shown here are for each chicken breast or for an entire meal. Do you add 1 oz of low fat mozzarella to each breast, or 1 artichoke heart for one breast? And is it 5 large basil leaves for each one as well. Thank you! Yes, all the ingredients listed are for one serving, so for one chicken breast. The calories and carbs listed assume you consume everything listed. Can you use broccoli to stuff it with? What was the side salad we saw? I would like to recreate this whole meal for my family and it looks especially delicious! This was so tasty. I followed the recipe to a “T”. There was ONE flavor that I kept running into that I didn’t love. I can’t figure out which one it is. Possibly the curry powder, as this is the odd ball of the recipe. I think next time, I’ll give a couple of different spices a shot. All the same, thank you for adding a recipe to my repertoire. The chicken was SUPER moist. I found that 25 minutes in the oven and 5 minutes resting allowed me to eat the meal at a PERFECT temperature. Found out my Husband is borderline Diabetic today. So we’ve decided to eat healthier and lose some weight… Im wondering if we could use spinach instead of artchoke?? 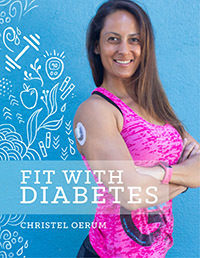 My husband and I have a G I diet book. I found recipe on the internet. Since we started the G I diet, we have started looking weight. I am looking forward to trying Healthy Stuffed Chicken Breast. Thanks for the healthy idea. Looks amazing. What sides did you pair with this? Cooking tomorrow for dinner. Some chicken recipes touch my heart, this is one of them. Can’t wait to try in my home. I reached a point where I was beyond tired of chicken breast. Would swiss chard work as part of the stuffing? I am growing it in my garden right now, and don’t know how best to use so much of it.